Tactical success can be obtained when the enemy commander believes he has lost: that is, when he has lost the will to continue. Violence, in the form of troop movement and weapons effect, is applied to make that happen. Using those terms, the key issue is that we have no good, simple, clear idea of how applying violence breaks the enemy’s will on the battle?eld. the enemy will repel attacks that are not properly co-ordinated. Manoeuvre: to find; to fix; to strike; and to exploit. Manoeuvre: to isolate; to envelope; and to encircle. That allows you to surprise and to shock. Apply HE [high explosives] to neutralise; but note that neutralisation does not mean defeat. It is transient and must be exploited. Only engage with small arms: at medium- or long-range, when necessary (and only when necessary) to suppress in order to enable movement; at short range, in the assault. This will not require much ammunition. Exploit all of the above. That normally means movement; it also means supporting subordinates and reinforcing their success. Above all, exploit surprise and shock action. Do not expect this to be anything other than confusing and chaotic. But, if you do it well, it should be highly effective. In 1950 my wife’s uncle, the son of a West Side of Chicago ditch digger, won a scholarship to MIT. Back then it was unusual enough for anybody from Chicago to go all the way to Massachusetts for college that the local newspaper printed a picture of him boarding the train for Cambridge. By the 1960s, however, the spread of standardized testing had helped make it customary for elite universities to vacuum up larger and larger fractions of the country’s cognitive talent. The long-term implications of this momentous change are quantified in Charles Murray’s new book on the evolving American class system, Coming Apart . Traditionally, Asian students succeed in part because they show good self-control from an early age. In one study, Chinese preschoolers were six months ahead of American children in developing mental control, like the ability to look to the left when shown a face pointing to the right. Another study found that Korean 3-year-olds did as well on such tasks as British children who were 17 months older. Like many brain capacities, self-control can be built through practice. Chinese parenting emphasizes child training, which combines close supervision of performance with substantial support and motivation for the child’s efforts. This approach comes at a great cost to parents and children. East Asian students study long and hard — in South Korea, 14 hours a day. Parental pressure there is so intense that the government has hired inspectors to enforce a 10 p.m. curfew on private tutoring. Fortunately for American parents, psychologists find that children can learn self-control without externally imposed pressure. Behavior is powerfully shaped not only by parents or teachers but also by children themselves. The key is to harness the child’s own drives for play, social interaction and other rewards. Enjoyable activities elicit dopamine release to enhance learning, while reducing the secretion of stress hormones, which can impede learning and increase anxiety, sometimes for years. Effective approaches for building self-control combine fun with progressively increasing challenges. Rather than force activities onto an unwilling child, take advantage of his or her individual tendencies. When children develop self-control through their own pursuit of happiness, no parental hovering is required. Find something that the child is crazy about but that requires active effort. Whether it’s compiling baseball statistics or making (but not passively watching) YouTube videos, passionate hobbies build mental staying power that can also be used for math homework. I’m not sure what Asian students’ 14-hour days and French students’ rigid tracking have to do with instilling discipline in young children. No one is always a forefoot striker or a heel striker. Your form depends on many factors, including your speed, the terrain, whether you’re tired and so on. But most of us have a predominant strike pattern, and so it was with the 52 Harvard runners. Thirty-six, or 69 percent of them, were heel strikers, while 16, or 31 percent, were forefoot strikers. The proportions were similar regardless of gender. More interesting was the distribution of injuries. About two-thirds of the group wound up hurt seriously enough each year to miss two or more training days. But the heel strikers were much more prone to injury, with a twofold greater risk than the forefoot strikers. Since the Boer War, if not before, infantrymen have been unable to advance in the open against tolerably well-organised defences equipped with rifles. The attackers’ casualties are simply too great. The minimum requirement for a successful defence is quite modest: high-velocity, conoidal bullets fired from half-decent breech-loading rifles. Anything more, such as automatic weapons, simply makes the attackers’ job even harder. In the early part of the 20th Century different armies came up with different ways of overcoming that problem. Many involved artillery or tanks. Some involved infantry heavy weapons, such as mortars. Most included a form of organisation and tactics by which the attacker used small arms fire to suppress the enemy. That enabled the attackers to move forward to the point where they could use bayonets, grenades and very-short-range small arms fire (at ranges of perhaps a few feet) to incapacitate any defenders who continued to resist. Critically, however, there was never much rational, explicit analysis as to how that took place. A few studies are quite insightful. It appears that a soldier’s ability to hit a given target is typically reduced by a factor of ten or so when he is moved from a static rifle range to a field firing area where he has to select cover, move, shoot and so on. It is reduced by a further factor of ten or so if there is an enemy firing back at him. It is reduced by another factor of ten if the enemy has machine guns, or if he has tanks; and by a hundred if he has both. We begin to see why many thousands of rounds can be fired, but very few actually hit. Another study reveals entirely different phenomena. It highlights that achieving surprise, or inflicting shock on the enemy are hugely effective. These are more effective than any likely force ratio, or the use of other weapon systems, and so on. Put very simply, if the attacker can find the enemy’s flanks and rear and attack him from there, or apply sudden concentrated violence to him and then exploit it, the enemy will typically give up quite quickly. He will then either withdraw, if he can, or surrender. A number of issues interact here. One is that using covert routes to find the enemy’s flanks and rear is clearly a good thing. Another is that the use of tanks or indirect fire to stun the enemy is very helpful. But within all of those tactics there is another critical factor: the attacking infantry’s ability to suppress the defender. That enables the attacker to move forward: either to close quarters to use bayonets and grenades, or around and past the defender’s positions to attack him from unexpected directions. Although relatively few of the enemy are typically incapacitated by small arms fire, their location and identity is often critical. For example, the clearance of one trench may allow the attacker to get behind several more, and start to roll up the position. Suppression is the effect of small arms and other weapons systems which temporarily prevent the enemy firing its weapons or moving in the open. In simple terms, it makes them keep their heads down. It is critically important. In the offence it allows the attacker to move forward, to find gaps and weak points, and exploit them. In the defence it prevents the enemy moving forward and firing, and thereby sets him up for counterattacks. In both cases it pins the enemy down for incapacitation (or destruction) by other weapons. A typical rifle — be it bolt-action or semi-automatic — will form a group of perhaps 40mm or better at 100m, if fired from a vice or clamp. A reasonably well-trained soldier firing the same weapon on a range can group at perhaps 100mm at the same distance. Very few armies train their soldiers to consistently beat that sort of accuracy. This has a huge consequence, which very few armies acknowledge: the weapon is in many ways irrelevant. As most modern small arms are more accurate than their firer, it makes very little difference which weapon is selected. There are many other parameters. Reliability, weight and ergonomics are all important. But accuracy is almost irrelevant, because many weapons are ‘good enough’ in that regard. What is far more important is to train the soldier to get the required effect from his small arms. In most armies he is trained to hit targets out to 300m or perhaps 600m. Yet in battle he rarely does that. He is rarely, if ever, trained to do what he really needs to do: suppress the enemy. Field research carried out in the Second World War provided a useful metric for small arms suppression, as did some more recent analysis. We can consider three cases: the need to suppress an enemy; the need to keep him suppressed; and the need to re-establish suppression once lost. In general, small arms fire has to pass within roughly a metre from the outline of the target to be effective. A small number of rounds passing through that area in a few seconds (perhaps 3 to 5 rounds in as many seconds) will suppress the target, or re-suppress him if required; whilst just one round every three seconds will keep him suppressed. That seems quite achievable. With a little coaching and feedback, a section of riflemen was able to suppress a (simulated) target more than twenty times as long with the same amount of ammunition. Now, if riflemen can hit within a meter of their target, but not within centimeters, perhaps they should be shooting shells with a one-meter kill radius. The study involved 15 right-handed test subjects who used a handle on a robotic arm, similar to a joystick, to control a cursor on a computer screen. The tasks involved starting from a set position to reach for a target on the screen and involved both inward and outward arm movements, Ahmed said. As part of the study, test subjects had to exert more energy in some reaching movements when the robotic arm created a force field, making subjects “push back” as they steered the cursor toward the target. With repeated practice of moving the robotic arm against the force fields, the subjects learned the task by not only cutting down on errors, but effort as well, according to Ahmed. The test subjects first performed a series of 200 reaching trials with no force field to push against, then two sets of 250 trials each when pushing back against the force field. The experiment ended with another 200 trials with no force field, said Ahmed. A metronome was used to signal the test subjects to move the robotic arm every two seconds toward the target during the trials. Each of the test subjects wore a nose clip and breathed through a mouthpiece to chart the rates of oxygen consumption and carbon dioxide production, a measure of metabolism. The research team also collected surface electromyographic data by placing electrodes on the six upper limb muscles used during reaching tasks: the pectoralis major, the posterior deltoid, the biceps brachii, the triceps long head, the triceps lateral head and the brachioradialis. I hadn’t ever watched The Atomic Cafe all the way through until recently, but I’d seen enough to know the tone and the basic message — look at those naive fools, thinking they could survive a nuclear war! In fact, what stands out to me now is how easy it is to compile footage of profoundly unfashionable people — fat farmers’ wives, Leave it to Beaver suburbanites, Richard Nixon — supporting certain ideas — in this case, civil defense, deterrence, anti-Communism, etc. — and to let that alone speak volumes to your hip audience. The other rhetorical tool that stands out is the constant conflation of surviving a direct hit from an ICBM-delivered nuclear warhead with surviving fallout from a nearby bomber-delivered atomic weapon. The people preparing for an atomic-bomb attack in the 1950s were preparing to survive another Hiroshima-style attack on the nearest city center, not a 20-megaton blast over their house. In Hiroshima, people survived just two or three hundred yards from ground zero, in solid structures that weren’t even formal bomb shelters. Founded in New York City in 1961 as the Fund for Education Concerning World Peace through World Law, the World Policy Institute has its origins in the post-World War II movement of moderate internationalists. Its founders — the banker Harry B. Hollins, and the banker and public servant C. Douglas Dillon inspired by the World Federalist thinker Grenville Clark — sought to develop international policies to prevent future carnage and devastation like what the world had just experienced. In 1963, the Institute’s name was shortened to World Law Fund. In 1972, it merged with the Institute for International Order, founded in 1948 and run by Earl D. Osborn. The combined organization adopted a new name, the Institute for World Order. In 1982, the World Policy Institute adopted its current name to reflect a shift from a primarily educational focus to incorporating a strong policy element, and founded World Policy Journal. From 1991-2007, the Institute was part of The New School, a university in Greenwich Village, New York City. In 2007, the World Policy Institute was re-incorporated as a free-standing institution, which works in active collaboration with like-minded organizations around the world. Everyone stands to learn something from the ways in which religion delivers sermons, promotes morality, engenders a spirit of community, inspires travel, trains minds and encourages gratitude at the beauty of life. In a world beset by fundamentalists of both the believing and the secular variety, it must be possible to balance a rejection of religious faith with a selective reverence for religious rituals and concepts. It feels especially relevant to talk of meals, because our modern lack of a proper sense of community is importantly reflected in the way we eat. The contemporary world is not, of course, lacking in places where we can dine well in company—cities typically pride themselves on the sheer number and quality of their restaurants—but what’s significant is that there are almost no venues that can help us to transform strangers into friends. The large number of people who patronize restaurants suggests that they are refuges from anonymity and coldness, but in fact they have no systematic mechanism for introducing patrons to one another, to dispel their mutual suspicions, to break up the clans into which they segregate themselves or to get them to open up their hearts and share their vulnerabilities with others. At a modern restaurant, the focus is on the food and the décor, never on opportunities for extending and deepening affections. Patrons tend to leave restaurants much as they entered them, the experience having merely reaffirmed existing tribal divisions. Like so many institutions in the modern city (libraries, nightclubs, coffee shops), restaurants know full well how to bring people into the same space, but they lack any means of encouraging them to make meaningful contact with one another once they are there. With the benefits of the Mass and the drawbacks of contemporary dining in mind, we can imagine an ideal restaurant of the future, an Agape Restaurant. Such a restaurant would have an open door, a modest entrance fee and an attractively designed interior. In its seating arrangement, the groups and ethnicities into which we commonly segregate ourselves would be broken up; family members and couples would be spaced apart. Everyone would be safe to approach and address, without fear of rebuff or reproach. By simple virtue of being in the space, guests would be signaling—as in a church—their allegiance to a spirit of community and friendship. Though there wouldn’t be religious imagery on the walls, some kind of art that displayed examples of human vulnerability, whether in relation to physical suffering, poverty, anxiety or romantic discord, would bring more of who we actually are into the public realm, lending to our connections with others a new and candid tenor. Rifles are precision instruments. In the hands of a sniper, one bullet often yields one kill — the actual number is closer to 1.5 shots per casualty. In the hands of ordinary soldiers shooting in the general direction of the enemy though, it takes roughly ten thousand bullets to inflict one casualty. In Vietnam, troops carried the M79 grenade launcher — effectively a 40-mm break-action shotgun. In the 1980s, this evolved into the M203 under-barrel grenade-launcher — same idea, but attached to an assault rifle. The M32 holds six rounds in a spring-powered revolver cylinder and has its own reflex sight that adjusts for the low-velocity rounds’ trajectory. But it couldn’t have happened without Richard J. Solberg Jr., a modest businessman from Alaska with a specific interest in introducing new weaponry to the U.S. military. Throughout the past 30 years, many large-bore semi-automatic high-capacity weapons manufactured in South Africa had seen great success worldwide with little footprint with in the U.S. military. This inspired Solberg to start Milkor USA, Inc., which became the first American company to manufacture an American-made version of the internationally popular South African 40mm MSGL, in the summer of 2004. The Tuscon, Arizona-based Milkor USA, Inc. opened its initial American manufacturing facility in Perry, Florida, in 2005 with the help of Erik Solberg and Bryan Newberry. Soon after, they were able to bring a 100 percent American-made version of the MSGL to the American market and immediately won their first contract with the U.S. Marine Corps. 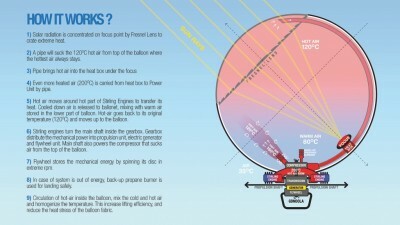 Fresnel Lens, located inside the balloon, concentrates the sunlight into a focal point to produce hot air. A 2-axis sun tracking system allows for the lens to constantly face the sun. 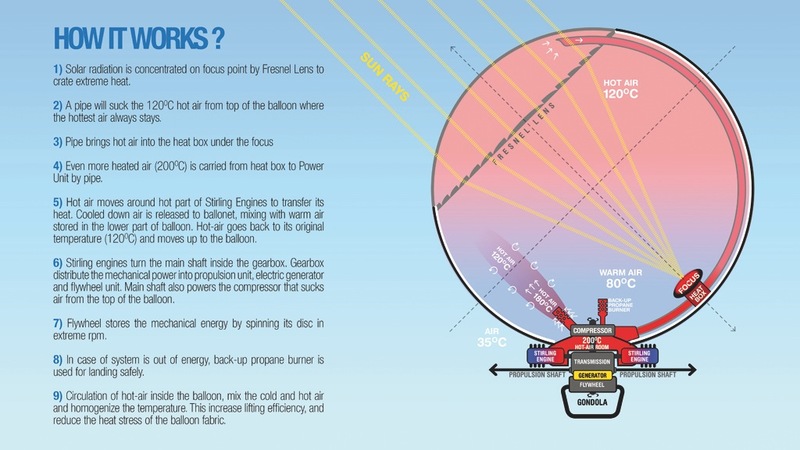 Motion is generated through the Stirling Engines, fueled by this hot air. Then the system mixes hot and colder air in the lower section of the balloon to create a homogeneous lifting gas. Beyond being a buoyant device, the well insulated balloon also acts as heat energy storage.This enables extra flight time for moments without sunlight. Any extra energy is then transformed into motion and stored in a flywheel as rotational motion. Power Trip is a darkly amusing documentary that looks at what happened when a bunch of dopey foreigners working for Dennis Bakke‘s AES tried to bring their “responsible” and “fun” corporate values to the former Soviet republic of Georgia after buying the nation’s nominally privatized power company. The Americans and Brits make sure to open up their office space and delegate as much authority as possible. Meanwhile, the power they’re buying from the national supplier is going to politically connected players and not to them. And their customers feel no duty to pay them. The Long Endurance Multi-Intelligence Vehicle is set to revolutionise air transport by being able to carry very heavy loads or intelligence kit long distances with the ability to land anywhere, including on the water. The Navy is looking to buy an LEMV to base above the fleet with sophisticated surveillance cameras to spot threats and spy on enemy movements. With a 50 ton payload it can also be used to carry urgent equipment parts such as engines for Joint Strike Fighters out to ships. With a mixture of 60 per cent helium and 40 per cent air it is far less vulnerable to enemy fire than the hydrogen filled Zeppelins that fell prey to the Fleet Air Arm’s incendiary bullets during the Great War. Tests by the Bedfordshire-based company Hybrid Air Vehicles have shown that bullets and even missiles can pass through the balloon without igniting the gas mixture which has a very low pressure. “This could be the ideal solution for logistical support for aircraft carriers and ISR (intelligence, surveillance, reconnaissance) for the Fleet,” said a Navy source. The airships will cost £60 million each and can be flown remotely as an unmanned drone. In Tough Targets, Clayton E. Cramer and David Burnett examine news reports of defensive gun uses in America. Many people support gun control regulations because they are convinced that the average citizen is either incapable of using a gun in self-defense or will use the gun in a fit of anger over some petty matter. Those assumptions are false. The evidence on this point has grown so strong that even President Obama has had to chide gun safety advocates to accept the proposition that “almost all gun owners in America are highly responsible.” And, as the scores of incidents described in this study show, gun owners stop a lot of criminal mayhem — attempted murders, rapes, assaults, robberies — every year. With urban street lighting, staying up late became fashionable, and spending that time in bed seemed like a waste of time. By the 1920s, the idea of a first and second sleep had disappeared.